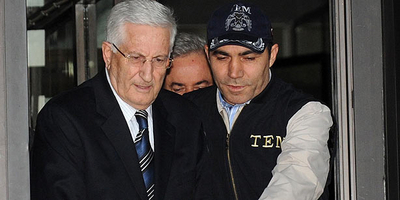 "Retired Gen. Çevik Bir jailed in postmodern coup case" reads the headline in Today's Zaman, complete with a picture of a policeman accompanying Bir as he left a courthouse after being arrested. Bir is the Turkish military figure I have had the most contact with, so his arrest has a personal feel that the other incarcerations did not. Apr. 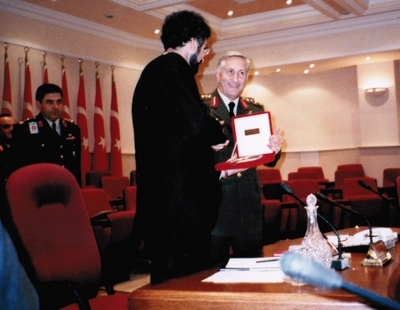 26, 2012 update: The AKP geniuses have now decided that I, of all people had a role in the 1997 military coup that overthrew the Erbakan government; see here and here. Even the country's leading columnist, Cengiz Çandar, has jumped on this bandwagon. (For an English-language interview with him, see "US, Israel behind Feb. 28 coup d'état, claims Çandar."). They conclude this in part from my connection to Çevik Bir, in part because he co-authored an article, "Formula for Stability: Turkey Plus Israel," in the Middle East Quarterly, the journal I founded and publish. They also focus on an article of mine, "A New Axis: The Emerging Turkish-Israeli Entente," that I wrote in 1996, which one Turkish newspaper helpfully translated today (as "Türk Israil Anlaşmasiyla Ortaya Çikan Yeni Eksen"), complete with an incendiary headline, "Siyonistlerin Gözüyle 28 Şubat" ("February 28 through Zionist eyes") and scare bolding. Apr. 13, 2018 update: Bir (and twenty others) has been sentenced to life in prisonfor his role in 1997. "A Corrective to the Pipes Worldview"